Las Vegas, April 30 - Long live the kings of the ring Floyd Mayweather, Miguel Cotto, Canelo Alvarez and Sugar Shane Mosley as they prepare for "Ring Kings: Mayweather vs. Cotto," the biggest fight of 2012 taking place this Saturday, May 5 at the MGM Grand Garden Arena in Las Vegas, Nev. which will be produced and distributed live by HBO Pay-Per-View®. The event features four of boxing's biggest stars who all boast the experience and records to merit the worthiness of the fight's title. With an average of 44 professional bouts each, these four fighters have the star power, skills and experience to make May 5 an unforgettable night of boxing. 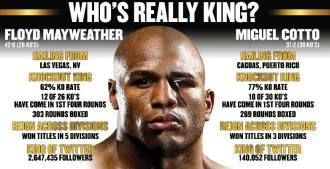 Below please find some of the most noteworthy facts and figures about Mayweather, Cotto, Canelo and Mosley which support their individual and collective "king of the ring" status. **Note: Interim titles/titlists not included in the above statistics. "Ring Kings: Mayweather vs. Cotto," a 12-round fight for Cotto's WBA Super Welterweight World Championship and the vacant WBC Super Welterweight Diamond belt, is promoted by Mayweather Promotions, Golden Boy Promotions and Miguel Cotto Promotions. Also featured will be Canelo Alvarez vs. Sugar Shane Mosley, a 12-round fight for Canelo's WBC Super Welterweight World Championship which is presented in association with Canelo Promotions and Sugar Shane Mosley Promotions and a 10-round welterweight fight featuring undefeated rising star Jessie Vargas and former World Champion Steve Forbes. Opening the pay-per-view broadcast will be a 10-round bout between super welterweight contender DeAndre Latimore and former World Champion Carlos Quintana which is presented in association with DiBella Entertainment. The mega event is sponsored by Corona, Hatfields & McCoys on HISTORY™, DeWalt Tools, AT&T, O'Reilly Auto Parts and Puebla - Cinco De Mayo and will take place Saturday, May 5 at the MGM Grand Garden Arena in Las Vegas and will be produced and distributed live by HBO Pay-Per-View® beginning at 9:00 p.m. ET/6:00 p.m. PT. Limited tickets for "Ring Kings: Mayweather vs. Cotto" are still available, with a total ticket limit of ten (10) per person. To charge by phone with a major credit card, call Ticketmaster at (800) 745-3000. Tickets also are available for purchase at www.mgmgrand.com or www.ticketmaster.com. Three Las Vegas MGM Resorts, Mandalay Bay, Monte Carlo and The Mirage, will host live closed circuit telecasts of "Ring Kings: Mayweather vs. Cotto." Advanced purchased tickets for the closed circuit telecasts are priced at $75, not including handling fees. All seats are general admission and are on sale now at each individual property's box office outlets or by phone with a major credit card at (866) 799-7711. Episode three of HBO's all-access reality series 24/7 MAYWEATHER/COTTO debuts on Saturday, April 28 (9:45 p.m. ET/PT), with the finale debuting Friday, May 4 (8:00 p.m. ET/PT), the night before the high-stakes super welterweight title bout. All four episodes will have multiple replay dates on HBO, and the series will also be available on HBO On Demand® and HBO GO®. NCM Fathom will broadcast "Ring Kings: Mayweather vs. Cotto" in high definition LIVE to more than 440 movie theaters nationwide. Tickets to see the fight on the big screen are available at participating theater box offices and online at www.FathomEvents.com.